I am no longer updating shanghaidiaries.com. Please visit my new personal blog at danwashburn.com. Update your RSS readers! I think this is something that everyone who gets married in China goes through — you are legally married before the actual big ceremony with friends and relatives. Kind of weird. Bliss and I have a nice ceremony for just the two of us planned in Thailand in September, and that will be the date on which we celebrate our anniversary, we think. We plan on having some kind of party in Shanghai later this year. And then we will have the official wedding reception on February 17, 2007 (Chinese New Year’s Eve) in Savannah, Ga. So, yeah, we are drawing this thing out as long as possible. And yes, mom and dad, this means I now have health insurance for the first time in four years. For no particular reason, I have scanned and uploaded images of my driver’s license and Ozzie’s dog license and immunization certificate. The driver’s license was actually much easier to acquire than the other two. I have only used it once, when we rented a car and drove to Moganshan in March. If you’d like to learn how to get your own Chinese driver’s license, the is some more info over at Shanghaiist. 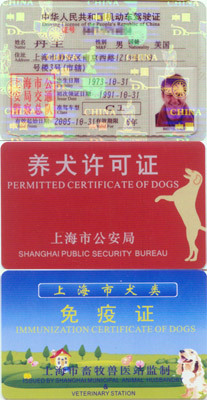 The dog licenses were the result of a long, frustrating process that I haven’t felt like writing about yet. It’s actually not that difficult once you find the only police officer in your district who knows what the hell is going on. Don’t rely on your landlord. And don’t rely on your friendly neighborhood policeman, who doesn’t really know the process but wants to help so much he creates a convoluted process of his own. Find a trusted Shanghainese friend and go to the police station yourself. And remember to bring RMB 2,000. Visit Trip Headquarters for the TripTik, the map and all other things related to The Trip. Shanghai Diaries is a website about Shanghai, China ... and lots of other stuff. Voted Best Mainland China Blog in the 2004 Asia Blog Awards. 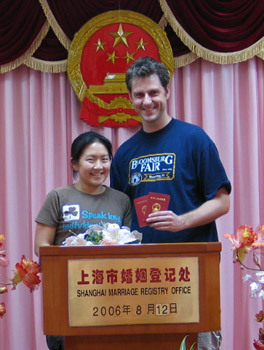 Dan is a freelance writer living in Shanghai. More about Dan. Visit an old colonial island in Xiamen and huge earthen roundhouses in rural Fujian. Scenes from my National Day 2005 holiday. Get some sweaty culture at the Asian Gaelic Games. Gaelic football comes to Shanghai! Jam with Xingfu 13 at the Shanghaiist.com launch party. Take a stroll through the Second Annual China International Adult Toys and Reproductive Health Exhibition, also known as the Adult Expo or the Adult-Care Expo. Copyright © 2019 Dan Washburn. All rights reserved. ISSN pending. Reproductions of any portion of this Web site only with the expressed permission of Dan Washburn. Shanghai Diaries is a hirefrank production using Moveable Type and Gallery with XHTML and CSS. Design consulting by pixelflexmedia. Questions, concerns or comments about the site? Drop us a line.